If you call these muffins, it’s okay to eat them for breakfast, right? 🙂 These moist and cakey muffins are transformed into doughnut-like treats when coated with cinnamon-sugar. They are perfect for a cool, autumn morning or for a special Halloween or Thanksgiving breakfast. This recipe was adapted from Everyday Food. I made them in a muffin pan this time, but next time may try a mini-bundt pan. I adapted the recipe to make them slightly healthier by incorporating white whole wheat flour and by serving them with sliced fresh pears. 🙂 They were worth every bit of indulgence! Preheat oven to 350 degrees (convection). Butter and flour 12 standard muffin cups. In a large bowl, using an electric mixer, beat butter and brown sugar until light and fluffy. Beat in eggs, one at a time, scraping down bowl as needed. Spoon 1/3 cup batter into each muffin cup and bake until a toothpick inserted in center of a muffin comes out clean, 18 to 20 minutes (on convection) or up to 30 minutes in a standard oven. Meanwhile, in a medium bowl, combine granulated sugar and cinnamon. Let muffins cool 10 minutes in pan on a wire rack. Working with one at a time, remove muffins from pan, brush all over with butter, then toss to coat in sugar mixture. Let muffins cool completely on a wire rack. 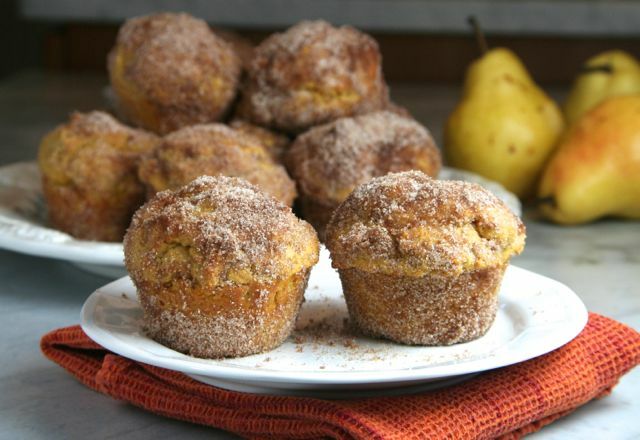 Love those muffins, I made something very similar but without the pumpkin, must try this. ooh these look awesome, I make some donut like cinnamon muffins that are stuffed with nutella, I will definitely have to try your pumpkin ones for sure! These are gorgeous Josette! Dusting them with cinnamon sugar is an awesome idea. I bet 🙂 fall goes so well with cinnamon and sugar. Wow, Josette! Do you deliver? I need to some of those muffins now! I have never tried a doughnut muffin before! How delicious are these.. I love that cinnamon sugar coating especially. Craving one to devour right now! pumpkin muffins sound like a great idea! Oooh looks like the perfect breakfast to me! Lovely! These would be a welcome addition to Muffin Tin Month! If you have a chance, pop over to Swirls and Spice to join the party! So, we tried making the muffins today, but my daughter forgot to add baking powder. Oops! I managed to salvage some of the yummy batter by turning it into waffles! I just added some liquid and baking powder to the batter. 🙂 Quite nice, actually! I’ve always wanted to make doughnut muffins. Your pumpkin version looks divine! Love these, they look delicious and my kids would love them too! Thank you so much 🙂 Good for grown-ups too! !